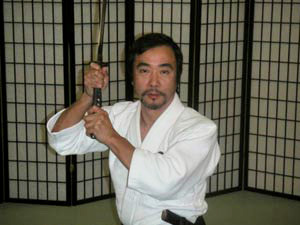 Masaji Saito-sensei has been practicing Toyama-ryu, Aikido and Ryukyu Kobudo since 1986, and Shinkendo directly under Obata Toshishiro Kaiso who is the founder, director and chief instructor of the International Shinkendo Federation, an organization dedicated to teaching authentic Japanese swordsmanship. The Shinkendo system emphasizes very traditional and effective swordsmanship, which with serious training, can provide practical ability as well as an insight into classical martial arts. Shinkendo is steeped in the traditions of the samurai, in such ways as heiho (strategy), reiho (proper etiquette) and philosophy. Historians confirm that the core of the majority of Japanese feudal warrior's martial education was that of swordsmanship. Shinkendo is a comprehensive reunification of what the samurai once used and relied upon for survival, and can be classified as a combination of the founder's own technical and structural innovations and an amalgamation of several traditions of Japanese swordsmanship that have evolved and splintered over time. Unified, Shinkendo is a historically accurate and uniquely comprehensive style of Japanese swordsmanship.